The record for the most distant object in the Universe ever seen has been smashed: a galaxy has been found at the staggering distance of 13.1 billion light years! There are thousands upon thousands of galaxies in this image, so imagine trying to comb through them to find… a dot. I marked the location of the galaxy with an arrow so you can see it. Seriously, it’s there. Get closer to your monitor, and you’ll see it just to the left of the arrow tip. 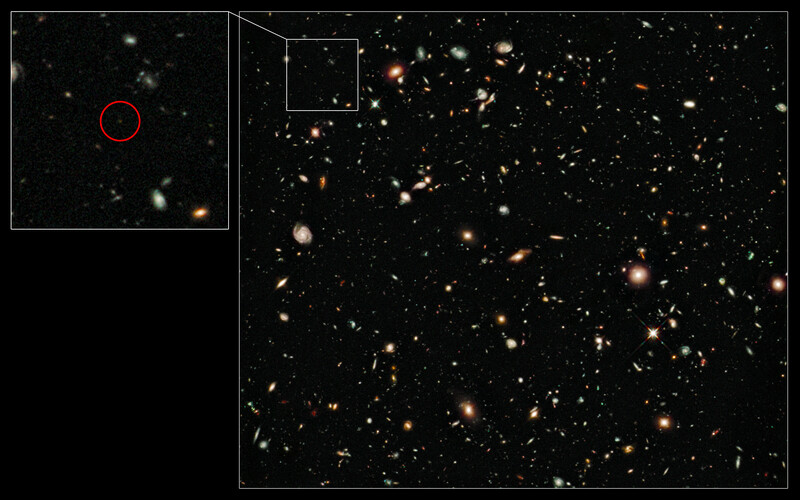 You can match up the galaxies near it with the zoomed picture at the top of this post to convince yourself (I had to do that to convince myself, too). But it’s there, and it blows away the record; a galaxy found just two years ago was the previous record holder with a distance of 12.8 billion light years. I want to be careful here: a gamma-ray burst was seen in 2009 that may have been even farther away than this, but that was an exploding star, a transient event. And there are other galaxies seen that may be farther away too, but their distances are estimated and have not been confirmed. So how was this one done? 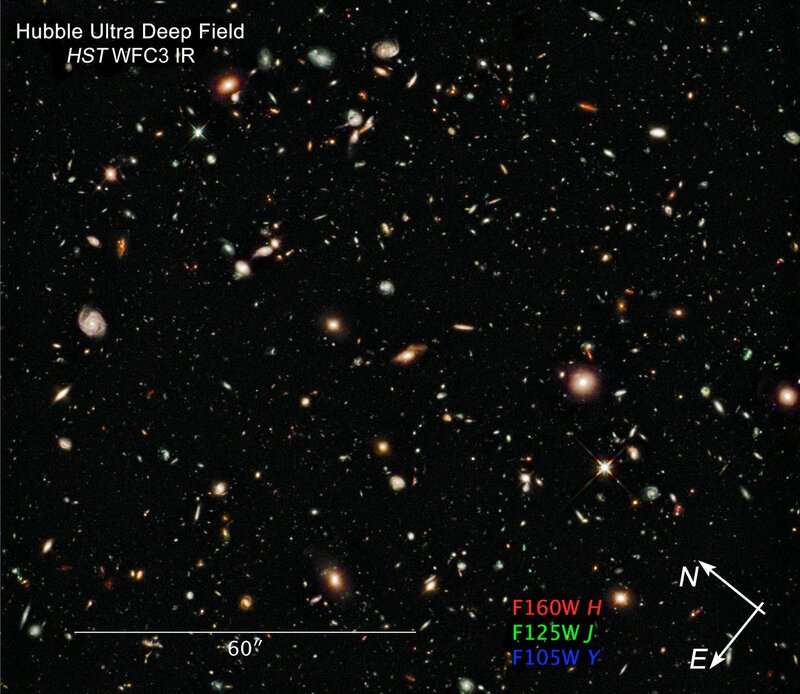 The image is of the Hubble Ultra Deep Field, a region of sky in the southern hemisphere. The idea was to point the telescope at a place where we know there was very little interference from gas, dust, and bright stars, so that extremely faint objects could be detected. Different cameras were used to take extremely long exposures; this one is from the Wide Field Camera 3 (installed on board just last year). It’s the deepest image ever taken of the sky in the infrared, and the total exposure was 173,000 seconds. That’s a solid 48 hours of exposure! The hopes for these images was to find the most distant objects in the Universe, and apparently it worked. The galaxy indicated, named UDFy-38135539, is one of several objects in the image that were flagged for further study. The images taken in different filters indicated it might be very far away (and not, say a much closer but extremely faint star). The Very Large Telescope was used to take spectra of the object; a spectrum is where the light from the object is broken up into colors (like a rainbow). This can provide useful information like an object’s composition, temperature, and for galaxies, distance. The expansion of the Universe itself shifts the spectrum of distant objects, similar to the way the sound of a car engine changes pitch as it drives past. In this case, the shift in the spectrum from UDFy-38135539 indicates the mind-numbing distance of 13.1 billion light years (for the afficiandos out there, the redshift is a whopping z=8.6). The implications of this are staggering, too. First, it’s thought the first stars formed about 400 million years after the Big Bang itself, so this galaxy must have been coalescing around the same time. Second, when the Universe was that young, it was filled with opaque hydrogen gas. Right around the time we’re seeing this galaxy, some sort of collection of massive energy sources switched on, sending out vast amounts of ultraviolet radiation which ionized the gas. We think the sources of this energy were giant black holes that formed in the centers of galaxies, which blast out radiation as they gulp down matter. Interestingly, this galaxy doesn’t appear bright enough to have done this on its own… perhaps it’s surrounded by a large number of smaller, fainter galaxies that lent a hand. We wouldn’t be able to see them, but collectively their power was enough to help out. We know very little about this era of the Universe, because it’s ridiculously hard to see anything that far away. But this image strongly implies there are lots of objects out there for us to study. The field of view of this image is tiny; it’s like the area of the sky blocked by a grain of sand held at arm’s length. If we find one object in that area on a random plot of sky, chances are there thousands of such objects scattered across the heavens, waiting to be detected. Hubble would have a tough time finding them, but the James Webb Space Telescope, being constructed right now, is designed to find them! It’s much larger than Hubble, and more sensitive to the infrared where these galaxies are brightest. It’s expected to find a lot of these objects. And when it does, our understanding of the infant Universe will explode. Even more fun will be all the weird things we’ll see that at first we won’t understand. How can a galaxy like this have formed so rapidly after the Big Bang? Did the stars form first, or later, or did it all happen at the same time? Does that change with different galaxies, different environments? What other types of objects are out there, 13 billion light years away, that we haven’t seen yet? It may not seem like it at first glance, but these questions tap into the very heart of philosophy. When we explore the edge of the Universe, we’re trying to solve the biggest question of all: how did the Universe come to be? Incredibly, after thousands of years of wondering, we’re actually now starting to learn the answer. And the farther we push with our telescopes, the closer we’ll get to it.